There is an exigent situation that threatens the existence of animals. Rhinoceroses, elephants, lions have been under attack and their numbers are now drastically reduced. Recently, the saga of Cecil the lion, in Zimbabwe, hunted down and beheaded by an American tourist, roused fury and controversy internationally. And, that is just one case that got media attention – illegal hunting still goes on unreported. Already, the northern white rhinoceros is on the verge of extinction with only five left on the planet. One of the significant things writing does is bring about awareness, and maybe justice, at times. This is what Gerald Kithinji’s has done with Masai Mara Adventures with Olê Ntutu. He has awakened in this reader disquiet about poaching; he has brought the immediacy of the need for rescue into his book. Masai Mara Adventures with Olê Ntutu is a poignant documentary about wildlife in the reserve park of Masai Mara. The author immerses readers in the animal kingdom as in a wildlife documentary. He uses fable by presenting the animals as characters that talk. The book is an excellent adventure about rural life and the Maasai of Kenya. It is the adventure of a boy suspended from school, who must find his parents in order to be readmitted to school. Olê Ntutu is a boy from the fringes of the Masai Mara Reserve. He is awarded a bursary to study at the prestigious Alliance High School in the west of Nairobi. He is caught fighting, with a bully, and is suspended and told to come along with his parents. Unfortunately, on getting home he discovers his parents have moved in search of greener pasture for their herds of cattle – nomads who do not have permanent homes, they move with the seasons. That the school authorities send away the young Olê Ntutu despite knowing he comes from a far place is testament to the disciplinary indiscretion of the school authorities. As a plot device however, it serves to reveal how schoolchildren may be exposed to bad influences when let loose during school hours. It is the season of migration in Masai Mara, and Olê Ntutu’s search means he is caught up in it. He stumbles on a sleeping rhinoceros named Kifaru. The conflict that ensues between them is born out of Kifaru’s animosity towards humans. It has just escaped from poachers from whom some of its family were unlucky not to escape. Determined to take vengeance on Olê Ntutu, it charges at him. Olê Ntutu is able to dodge with perfect timing and Kifaru rams into a tree and blacks out. Kifaru sustains a fatal injury from the impact, but bent on vengeance it pursues and stalks Olê Ntutu, who is only able to elude Kifaru with the aid of friendlier animals, like Twiga the giraffe. A group that also witnesses the migration in Masai Mara is the Lees. They are on a safari in a hot-air balloon. Lee Junior, their son, is busy taking pictures when he takes a few pictures of Olê Ntutu on a zebra while the latter is trying to elude Kifaru. Alerted to this bizarre occurrence, their tour guide radios the Wildlife Services. The park rangers begin searching the reserve for traces of the boy or any dead animal that might suggest poaching. 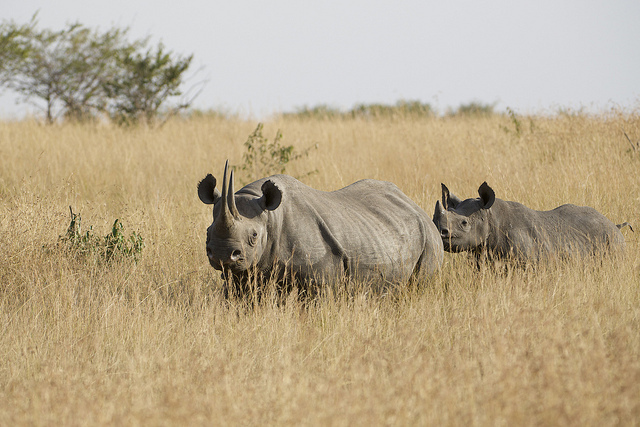 They come upon a rhinoceros that is close to death and that confirms their suspicions. Olê Ntutu is later apprehended at the hotel where the Lees are staying when he is to join a group of entertainers who are billed to entertain tourists at the hotel. The rangers are eager to make a scapegoat of the boy, but there is one more twist to the tale and the plot reaches its climax in a courtroom drama. One lapse in the storytelling is that the culprit who dehorns the dead rhinoceros is never revealed, beyond hints that it could be one of the high-ranking rangers. The author also has the habit of having his characters monotonously repeat in dialogue what has already been given in narration. Again, it should be pointed out that editorial slackness results in errors of the sort found on p 53 where throes is spelt ‘throws’. Masai Mara Adventures with Olê Ntutu calls our attention to people who under different guises hunt animals for pleasure and for illegal trading. It tells of the place of the Maasai and their intimate relationship with animals in the wild. It also tells of the relationship between animals. Gerald Kithinji’s style of writing is exciting and educative. He is the kind of author whose writing encourages young readers to read more.